I have been looking for a pair boots to fit my narrowish foot. I tried the Alpinestars Web Gortex boots, but the width was just too much for me, even with inserts. After sampling many boots, the Sidi Vertigo Boots may just be the ticket. The Vertigo is constructed of Lorica, a composite microfiber material that is tough and breathes well. Armor abounds on this boot. Externally, there are scuff guards on the outer front of the toe cup, at the ankles, the shin, the heel, and at the calf. Internally, the toe and heel are reinforced as well. One very unique design is the adjustable calf that ratchets to accommodate different rider sizes. It also adapts to be worn inside our outside the pant leg. I really like this feature. The boot has adjustable vents on the outside of the instep area. There is also a Teflon-treated internal fabric in order to allow moisture to "breathe" out to the Lorica. This is a cool and comfortable boot. As far as fit goes, these Sidis seem to run fairly true to size with a tendency slightly to the small side. As I mentioned before, they run quite narrow, so my wide-footed friends need not apply. Also, they are a race-oriented boot, so they are stiff; they are really not a "walk around all day" boot. 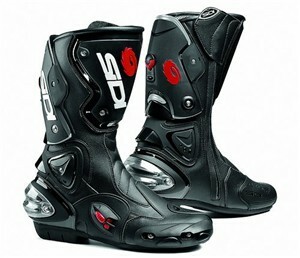 These boots are a good option for the serious sport rider. They may just be my next pair of boots.